This is a recipe for Platform Operators and Space Developers. In order to install and configure the Pivotal Single Sign-On tile, you must have rights to Ops Manager. In order to configure a SSO service instance and bind applications to it, you must be a space developer on a space within an org to which the SSO tile was provisioned. This recipe describes the steps necessary to install and configure the Pivotal Cloud Foundry (PCF) Single Sign-On tile backed by an internal user store. These steps are more or less taken directly from the references listed at the bottom of this document, with additional context provided, as well as corrections to the documentation. Over time, it might be prudent to prefer the original sources as they are curated, while this recipe is not. Before the Pivotal Cloud Foundry SSO tile can be consumed by developers and bound to their applications, it is necessary for a platform administrator (Pivotal refers to them as Operators) to install, configure, and provision the tile to a given space. Download the PCF Single Sign-On product tile from Pivotal Network. Upload the product tile to your Ops Manager installation. See Adding and Deleting Products. Click Apply Changes to deploy the service. Tip Steps 1,2 & 4 will require the Operator to Apply Changes. Currently, applying changes will attempt to redeploy everything. While BOSH is smart enough to skip several steps, there are typically several errands associated with each tile that will run. Depending on the maturity of your Cloud Foundry configuration, you may be able to avoid unnecessarily long deploy cycles by temporarily disabling some errands. From the Installation Dashboard, click the Elastic Runtime tile. Select SSO Config on the Settings tab. Under Provider Name, enter https://login.system.pcf.local. Under Provider Metadata URL, enter https://login.system.pcf.local/saml/metadata. Or download your metadata from https://login.system.pcf.local/saml/metadata and enter it under Provider Metadata area. Return to the Installation Dashboard and, once again, click Apply Changes. Note These steps reference *.system.pcf.local URLs. This represents the System Domain. In new deployments of PCF, you will need to replace this with your actual system domain. After Ops Manager has finished applying your changes, login to the SSO dashboard at https://p-identity.system.pcf.local using your UAA administrator credentials. You can find those credentials in the Pivotal Elastic Runtime tile under the Credentials tab. From the SSO dashboard, create a new Single Sign-On Service Plan by clicking New Plan. Choose a Plan Name, and enter a Description. Choose an Instance Name. The instance name appears on the login page and in other user-facing content, such as email communications. Under Org Visibility, select which organizations should have access to your Single Sign-On Service Plan. If you do not select any orgs, that plan will be completely hidden in the Services Marketplace. Click Save Plan. Your new plan will appear in the Apps Manager Marketplace to users in the organizations you have selected. You can also access the Services Marketplace by entering cf marketplace in a terminal window. As described in the above section, every service plan corresponds to a tenant. Each service plan is accessible at a tenant-specific URL in the format https://sso-internal.login.system.pcf.local. Note Certificates are updated via the Elastic Runtime Tile in Ops Manager on the Security Config panel. After updating your SSL Certificate as described above, it will be necessary to Save and Apply Changes one last time. This concludes the Platform Operator portion of this recipe. Assuming you have Space Developer credentials on a space in an org to which the SSO tile was provisioned (in our case dap), proceed to the next section to create and configure a service instance to be used by your applications. After you have made the plans visible in the relevant PCF organizations, create a service instance to use the service plan within a space. While service instances are accessible only within a space, service plans are visible across spaces and orgs. Every plan needs a service instance in every space containing applications it will access. If you have a plan that allows Single Sign-On to applications in multiple spaces, you must create a service instance for the plan in each of the spaces. Service instances are created based on the service plan and are visible within the confines of a space. Log in to your Apps Manager instance at https://console.system.pcf.local as a Space Developer. Navigate to the Marketplace and select Pivotal Single Sign-On. Choose a space for the instance from the Add to Space dropdown menu. The default is development. 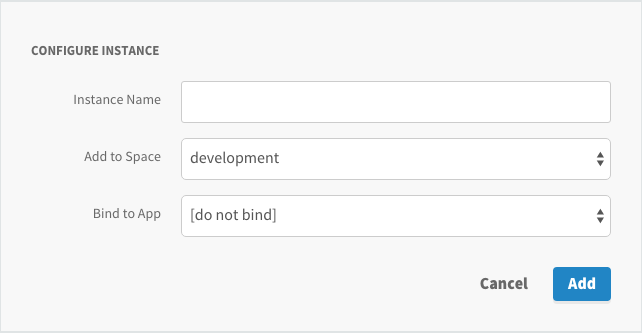 Choose an application to bind the service instance to from the Bind to App dropdown menu. This option defaults to [do not bind]. Note Unless you already have an OAuth-aware application deployed in the selected space, leave the Bind to App value as [do not bind]. We will configure and bind an app to this service instance later on. Note The Pivotal SSO Tile documentation instructs us to configure an external identity provider at this point. However, this recipe leverages UAA as the internal user store. In order to add users to the Internal User Store for a given Service Plan, you must use the UAA Command Line Interface (UAAC). If you do not already have the UAAC installed, run gem install cf-uaac in a terminal window. The following steps describe how to use UAAC to add users to your Service Plans. When prompted with Client secret, enter your Admin Client Credentials located in teh Credentials tab of your Pivotal Elastic Runtime tile. Update client registrations for identity and add password as a supported authorization grant type. $ uaac client update identity --authorized_grant_types "refresh_token, password, client_credentials, authorization_code"
When prompted with Client ID, type identity and press enter. For Client secret, enter your Identity Client Credentials, located in the Credentials tab of your Pivotal Elastic Runtime tile. For User name, enter admin. Enter your Password, which is located in the Admin Credentials under the Credentials tab of your Pivotal Elastic Runtime tile. Find the Identity Zone ID of your Service Plan by logging into the SSO dashboard, selecting Edit Plan, and copying the Identity Zone ID from the URL. The highlighted text in the example URL above is the Identity Zone ID of the Service Plan. When prompted with Client secret, enter the secret from the uaac curl command above. Bind your application to a service instance from the Apps Manager Console. Register your application from the Pivotal Single Sign-On service dashboard. When you bind an application with the Pivotal Single Sign-On service, an OAuth Client is registered with the Single Sign-On server. This OAuth Client acts as an OAuth 2.0 Authorization Server and issues tokens. The application type is Web App. The User Store Connection is an Internal User Store. This means that users are stored in the user store provided by Pivotal Single Sign-On. If you register your application with the Pivotal Single Sign-On service dashboard, you gain access to a larger selection of application types. You can also configure the User Store Connection to an external identity provider with SAML. Your application must be able to request and validate an OAuth or OpenID Connect token. Refer to the Application Integration section for general information regarding how to integrate with the Pivotal SSO tile.